Last Friday, I sent home math and science study guides. I'm sorry to give these tests the week after Memorial Day, but it's a busy time of year! Talking with students last week, it seems that we will need to take another look at photosynthesis, and we'll do that this week. The math study guide is due on Wednesday, and the science study guide does not need to be returned. Students will take Math M-STEP tests on Tuesday and Wednesday of this week, and then M-STEP testing will be done for the year. If your child has a summer birthday, I would still love the opportunity to celebrate. If you would like, please email me about a day for your child to bring in treats, and we should be able to work it out! We're excited for our field trip to Berrien Springs on Tuesday, June 2nd! Soon I will be sending home a note with a few details about bringing a sack lunch, etc. Thank you to those who volunteered to chaperone. We are excited to have you and excited that you'll be able to spend some time with your child. As it turns out, we have a lot of chaperones for the trip. This is just a reminder that chaperones will need to drive separately, and it's possible that there will only be a couple of students in each group once we get there. Third graders begin M-STEP testing this week. The M-STEP replaces the MEAP and it is computerized. Our students have been completing practice activities and I know they will do a great job on the tests! This Monday, Tuesday, and Wednesday will be the Language Arts portion of the test. Please make sure your children are well-rested and well-fed! We are done with spelling for the year. Have a great week! We are walking to Martin's on Tuesday afternoon for a small field trip that will conclude Junior Achievement. Thank you so much Mrs. Baldeosingh for teaching students about economics in real-world applications! Our class will begin to study government this week, and key concepts will include what the government does for its citizens, citizens' rights, and the three branches of government. In Math, we will develop a deeper understanding of multiplication by exploring the distributive and commutative properties using diagrams. If you have any empty egg cartons in the next week or two, please send them in to our classroom. We will be using them to study equivalent fractions. Here are some photos of the wax museum. Have a great week! Last Friday, students wrote a brief speech for the wax museum that included the person's name, birth date, for what he/she is most famous, and an interesting fact. They copied these speeches onto two papers, one for school and one for home. We will practice at school, but also feel free to practice at home as the wax museum approaches. In science, we will continue to study plants. We will discuss the function of the roots, stem, leaves, and the process of photosynthesis. In math, we are beginning a multiplication unit in which students will solve multi-step story problems and explore strategies for solving 2 digit by 1 digit multiplication problems. Students will be completing a few different writing assignments independently (opinion, informative, narrative) to demonstrate an understanding of writing for different purposes. It has been great to see the progress that students have made in this math unit! They have learned to list attributes of two dimensional shapes, and find the area and perimeter of rectangles. There will be a math test this Friday, and students will be bringing home a study guide tonight. It will be due the day before the test. Students have also made such great progress with multiplication facts! I won't assign homework this week other than the math study guide, but I am asking students to study their math facts for a few minutes each night. We have a couple of weeks left to reach and pass the 9's. Also, I am noticing that some students struggle on mixed tests that contain multiple fact families. It would be beneficial to occasionally use a variety of facts while practicing. Students will use their outlines to write final drafts of their biography reports. I am very pleased with the independence they have shown while taking notes and organizing their ideas! The wax museum is coming up on May 8th. You should have received an invitation in your child's take-home folder. Please remember to use the slip at the bottom of the page to RSVP for anyone that will be attending. NWEA computerized testing begins this week. We hope to complete all three sections (Reading, Math, and Language) in the next few days. Toward the end of the month, students will take the M-Step assessment that is required by the state of Michigan. Check out the photos tab of this website to see pictures of students' instruments from the last science unit. Have a great week! Check out the buildings and the city that students created during Junior Achievement as they learned about communities and economics! The spring music concert is tonight at 7:00 at the high school. Students should arrive between 6:30 and 6:40, and unlike previous years, we will meet near the front of the auditorium rather than gathering in a classroom first. Students did a great job taking notes on their biographies last week. Now they will use an outline to organize four different paragraphs - introduction, childhood, adult life, and lasting impact. They will create a topic sentence for each paragraph with supporting details. This has been such a great project to practice reading comprehension and writing organization! Another reading skill this week is theme. We will read passages and find themes (often main ideas or lessons that are woven throughout the story). Students finished their Michigan travel posters last week to persuade people to visit Michigan. These posters included natural resources and human-made features that would be attractive to visitors. This week we will begin a science unit on organisms. We will define, "What is a plant?" and discuss the functions of each plant part (stem, roots, leaves). I hope you had a nice spring weekend! Students should bring their biographies to school each day for the next couple of weeks. They will begin taking notes and then organizing their writing into paragraphs. As they take notes, they will be focusing on three main categories: childhood, adult life, and lasting impact. In Social Studies, we have been studying three main concepts: physical features, climate, and natural resources of different communities in the United States. We also brainstormed natural resources (Great Lakes, crops, forests...) and human-made attractions (Mackinac Bridge, Comerica Park, Henry Ford Museum...) that are important to Michigan. In order to demonstrate understanding of these concepts, students will be working on a travel poster that would attract people to Michigan. In Math, we will continue to study perimeter and the attributes of different polygons. For example: a parallelogram has two sets of parallel sides. Opposite sides are congruent. It is a quadrilateral. If all the sides are the same length, it is a special parallelogram called a rhombus. Before spring break, you should have received a note about the biography and wax museum project coming up this month. Please let me know if you need another copy. In brief, students need to have chosen a grade-appropriate biography about a famous person that he/she would like to study by Monday, April 13th. They will have the opportunity to choose a book this Wednesday during library time, although selection is limited. They can also feel free to bring one from home or from the public library. At school, students will work on writing a biography report. Our wax museum, in which students will dress up like the famous person and tell a few facts, will be on Friday, May 8th,from 9:30-10:30. Today, we will start to read the biography of Jackie Robinson together as a class. I will teach students to take notes and organize information so that they will be ready to do that with their own biographies next week. We will begin a geometry unit in Math. This week, we will identify attributes of different 2-dimensional shapes. For example, a polygon is any closed figure with three or more sides that are straight. A rectangle has four right angles, two sets of parallel sides, and opposite sides that are congruent. A square is a special type of rectangle in which all the sides are the same length. We will also identify the attributes of parallelograms, trapezoids, and rhombuses. In Social Studies, students will study natural resources and how they affect the economy of a region. We will also begin a Junior Achievement program in which a community member visits our classroom each Tuesday afternoon to teach students social studies concepts in a meaningful way. Junior Achievement's purpose is to "inspire and prepare young people to succeed in a global economy." Last week, in preparation for the M-Step, students read two different articles about astronauts and then typed an article of their own, using evidence from both of those sources. It was good practice for reading, writing, and typing skills. Not everyone had time to complete the article, but I will be sending some of them home today. Have a great week! We have a lot going on in the next two weeks leading up to break! I'm sorry that so many tests and projects are falling during this period, but there is a lot to wrap up before break! I will be sure not to assign homework other than the items listed on this page. Students should already be pretty well-prepared for the tests based on the work they have done in the last few weeks. Math: There will be a test on Thursday, March 19th. The study guide is coming home today and is due the day before the test. Science: There will also be a test over "light" on Thursday, March 19th: The study guide is coming home today and does not need to be returned. It simply states some key points that students should have gathered from this unit. Science: Students have an exciting opportunity to create their own instruments at home. You should be receiving a letter about this project today. Please notice the grading rubric at the bottom of the page, as this project takes the place of an assessment for "sound." The instrument is due on Monday, March 23rd. Spelling: There is a test this Friday, March 20th, but there will be no test the week before break. Parent Survey: Directions for completing an online survey are coming home today. Thank you for taking the time to do that! Your answers will be anonymous. Thank you for supporting your child's education! Earlier in the year, students wrote a personal essay that fell into the framework of an "opinion piece." I want to give students more practice with opinion writing, so we will be writing book reviews. Students will form an opinion about a book they choose and then write a review using details and examples from the story. Occasionally, I hear offers from people who would not mind helping out with classroom jobs. In the next week or two, I could use someone to help with the informational books. It would consist of laminating 24 front covers and back covers, and then binding the stories together using the binding machine in the workroom. There is no pressure, but let me know if you would be interested. Our reading skill this week is cause and effect. Please encourage your student to be reading and recording minutes for March is Reading Month! We're trying to read enough to get Mr. Paulus into the end-of-the-month shootout! Later in the spring, students will be taking a computer-based assessment called the M-Step that will require some typing to answer short answer questions. In order to prepare them for this test and for future grade levels, we have occasionally been using typing.com for practice. I know students will not have these skills mastered, but I am hoping that at least some exposure will help them to feel more comfortable with the keyboard. If there is time over break, feel free to practice on that website or use other activities. Students should know their usernames and passwords, but feel free to contact me if they are unsure. I'm looking forward to conferences this week! We will finish reading Stone Fox this week (chapters 6-10). This project has allowed us to have great discussions about characters, and conclusions we can draw based on their actions in the story. In writing, our informational books are taking longer than planned, but they are turning out well! With each student writing an introduction, four chapters, a conclusion, a glossary, and four text features, I should have expected that! Students will use the majority of the week to work on final copies. In math, we will be practicing different strategies to solve multiplication and division story problems. Through a few science experiments, students will explore how shadows change size based on the position of the light source, and how light travels through water different than it travels through air. You should have received information about Roosevelt's "March is Reading Month" activities. Make sure to track those minutes at home! We had a blast and learned so much at Community Day! Check out some photos. Have a great week! Today we are making up the spelling test that we missed from last week, and the new words will be coming home. I'm sorry that there is less time than normal to study! In Writing, students will edit and revise their informational books so that we can soon begin the final copies. During this project, we are learning to go back through our writing each day in order to apply new skills that are taught during mini-lessons (transition words, add-on details, topic sentences...) Good writers are not afraid to make a rough draft a little bit messy in order to make improvements! In Math, we are beginning a new unit and we are studying the relationship between multiplication and division. Thank you for practicing multiplication facts at home! In Science, we will continue to study light. Key concepts include that light travels through materials differently, light can be reflected by certain materials, shadows are made when light's path is blocked, and that shadows form in the opposite direction of the light source. We have occasionally been using the MacBooks to practice typing in our classroom. Students have accounts at www.typing.com which they can also access at home if they wish. At this point, I am encouraging students to keep their fingers on the home rows and then to work as slowly as they need to in order to gain familiarity with letter locations. In the next few years, students will be asked to type even more within classroom activities and computerized tests. I will administer a few timed multiplication tests this week. Please make sure that your child is finding a little bit of time to practice at home, whether it be through flashcards, paper and pencil, or websites. A few games are listed in the Learning Links section of my website. In Math, we will have a test this Friday over measurement concepts, story problems, and fractions. Comparing fractions and finding equivalent fractions are challenging concepts for third graders, but we have used a lot of visuals and manipulatives to practice. The study guide is coming home today and will be due this Thursday. Remember that Community Day is coming up on Friday, February 20th, and that the store permit is due this Friday, February 13th. A letter came home last week about the event. Students will participate in a few simulations this week to learn about market economy, supply and demand, and pricing. In Writing, students are continuing to work on their non-fiction books by creating text features (diagrams, charts, labeled pictures, timelines...) and writing chapters. It is fun to read these stories and to see the varying interests of my students! In Reading, students will work on summarizing fiction passages. Summarizing can be more challenging that retelling. Rather that just listing the events in the story, it requires students to synthesis the main ideas or patterns within a story. Students will also read a folktale called, "The Fisherman and His Wife" and then work on summarizing, visualizing, sequencing, and vocabulary skills the remainder of the week that coincide with the story. In Writing, students will continue to work on first drafts of their non-fiction books. Last week, they chose a topic and organized their information into subtopics. Using those subtopics, they will complete about one chapter each day. These books will include text features such as pictures, captions, diagrams, and charts in order to provide information about the topic. Soon we will also begin learning about economics in Social Studies. I am sending home a note about Community Day, which is coming up on February 20th. Please make sure your child is beginning to think about what he/she might want to sell. Have a great week! There will be a social studies test this Friday. I already sent home a letter about this test, along with a timeline and informational slides that will serve as the study guide. I am encouraging students to study a little bit each night in order to prepare for the test. Please let me know if you have any questions! In math, students are developing a basic understanding of fractions. With the help of pictures, they should be able to identify equivalent fractions. They are also learning strategies to determine if a fraction is greater than, less than, or equal to half. Finally, they should be able to compare unit fractions. A unit fraction is any fraction with a 1 in the numerator (1/3 is greater than 1/10). Personal Narratives: It is so fun to hear these stories! I graded and filed the personal narratives that students completed this week. However, I wanted you to have the opportunity to read your child's writing as well. You will see a copy of the personal narrative coming home today that does not include the grading sheet. At conferences, I would be happy to show you the grading sheet so that we can discuss your child's progress as a writer. Timed Multiplication Tests: As we continue to study measurement and fractions, we will also spend a few minutes each day practicing multiplication fact fluency. A couple of times each week, students will complete a timed multiplication test. Each test contains 20 problems for students to complete in 1 minute and 20 seconds (which averages to 4 seconds per problem). If students pass the 1's test by earning a perfect score, they will move on to the 2's for the next test. You will see "Pass" written at the top of the paper. Otherwise, nothing will be written. By the end of third grade, the goal is to know all facts through 10 x 10. This week, we will discuss reasons why pioneers from the east began to settle in Michigan. Through a simulation in which students purchase land and draw scenario cards, students will also discover why life could be difficult for pioneers. We will practice two reading skills this week: visualization and making inferences. On Friday the 23rd, students will use laptop carts to take the NWEA tests in the areas of reading and math. Have a great week! I hope you had a great break! In Math, we will study measurement. Students should be able to measure to the nearest 1/4 inch. They should also be gaining a better understanding of different types of measurement, such as mass and volume, and units that can be used for each. This week, we will explore relationships between milliliters/liters, grams/kilograms, and millimeters/centimeters/meters. In Writing, we will revisit personal narratives for the week, which will allow students the chance to tell a story from their holiday breaks. One key lesson will be "zooming in" to a topic. In other words, zoom in to one special moment or one small event, and capture that moment using specific details. Our next Social Studies unit involves the settlement of Michigan. We will discuss the conflict between the British and the French (both sides wanted control of Michigan for trading furs). We will also discuss why people from the eastern part of the country moved to Michigan (cheap land for farming) and what sorts of things made that trip easier (The Erie Canal). Our Reading skill this week is using sequence to improve comprehension. We will practice sequencing the events of non-fiction and fiction stories after reading. Today I will hand out the new spelling words for the test this Friday. Have a great week! We have a variety of things going on this week! We will continue practicing our reading skill, cause and effect. We will also gain a better understanding of measurement in math, and complete some skill assessments to prepare for the report card. There is no spelling test this week. We do have a science test this Wednesday. You should have received a note about the test last Thursday. Since we do not have a science textbook, I had stuents create some study notes that cover key concepts and that can be used to study for the test. I asked them to take the notes home over the weekend and each day leading up to the test. We are looking forward to seeing many of you at our Author Celebration this Thursday! Please remember to send me an email if you think you are coming. We will not have a spelling test next week, so the test this Friday will be the last one of the month. While watching Because of Winn Dixie, students will complete a Venn Diagram to compare and contrast the book and the movie. They will also write a paper to tell about the similarities and differences. In Reading, we will also explore cause and effect relationships within a text (WHAT happens and what CAUSED it to happen). In Science, we will study natural resources (any materials from the Earth that humans use to make things or to produce energy), and the difference between renewable and non-renewable resources (resources that cannot be regrown or made again). We will also study slow land changes (water, wind, plants, and ice can cause erosion) and rapid land changes (volcanoes, earthquakes, and landslides). We will most likely have a test on Wednesday the 17th. Students are creating study notes that can be used to study for the test. In Math, we will begin studying time (to the nearest minute), measurement, and fractions. I hope you had a wonderful Thanksgiving break! Students are writing final copies of their personal essays this week. A note came home about our Author Celebration on December 11th. Please remember to let me know through a note or email if you plan on attending. The students are looking forward to having an audience for their writing! We have a math test this Thursday on triple digit addition and subtraction, rounding, and story problems. The study guide is due on Wednesday so that we can discuss it in class. I will send the study guide back home on Wednesday night so that students can use it to study for the test. In reading, we will be studying story elements that include setting, characters, and plot. We will focus on motivations, and what causes characters to act the way that they do. Since students have a shorter time period than normal to practice spelling words, and because there is a math study guide and test, there will be no other homework this week. Thank you SO MUCH for the books you purchased from the book fair for our classroom library. The students will love having some exciting new books to read! We will practice making inferences while reading this week. Students make inferences when they use clues from the story to draw their own conclusions. In other words, they read between the lines to find implied messages that the author intended but did not actually state in the text. In Writing, students will write the two body paragraphs in their personal essays. These two paragraphs are small stories from their lives that support their opinion statement. In Math, we will continue to study addition and subtraction strategies, rounding, and story problems. A Book Order is being sent home today. Even though the book fair was here last week, I wanted to send out a book order so that books would arrive before the holidays. Please notice that I have switched to online ordering. See the note attached to the book order for more details. Have a great week! We have a lot of wonderful things going on this week! In Science, we will be observing rocks. Students will conclude from their observations that rocks are made up of minerals. There is a Social Studies quiz this Wednesday on the early French explorers. A note came home last week with more information, but please remember that students should be using their reading notes packet from chapter 3 to study. In Language Arts, we have been analyzing different essays in which authors tell about a life experience that taught them a lesson, or a big idea. Students will be brainstorming experiences in their lives in which they have learned similar lessons. A few examples of big ideas include honesty is best, even when it's hard, and friends are always there for each other. Students will choose a big idea that they relate to the most for their essays. In Math, we will be discussing strategies for solving triple-digit addition and subtraction problems. Although we encourage students to solve problems many different ways, students must at least have the ability to apply the traditional algorithms (borrowing and carrying). It is also important to expose students to other strategies in order to build their understanding of numbers and their future mental math skills. I'm looking forward to meeting with you at conferences! We had a wonderful first marking period! I'm looking forward to the second marking period and the continued progress that students will make! In Reading, we will be studying author's viewpoint. As we study author's viewpoint, we must keep in mind that authors have different reasons for writing different texts. For example, a writer who is creating an advertisement for a new car must make the car sound appealing. A writer who is not in favor of a presidential candidate might only write bad things about the candidate. We must keep these things in mind as we read. In Writing, we will begin a unit on personal essays. In a personal essay, students create an opinion statement such as, "I believe that change can be difficult." Then they will brainstorm small stories from their lives that have helped them to learn that lesson; for example, the time I had to change schools. In the end, they will learn to put the opinion statement together with the small examples from their own lives in order to create a small essay. This week, we will mostly read and learn from the writings of other authors. In Social Studies, we will be finishing the Native Americans and Explorers unit. Students learned four reasons why the French traveled to Michigan. They also learned about four important explorers: Etienne Brule, Jacques Marquette, Robert La Salle, and Antoine Cadillac. We have been reading and completing reading notes together as a class. On Thursday or Friday, students will take these reading notes home so they can study for a quiz that will most likely be given on Tuesday, November 11th. I will be sending home a note about the quiz later in the week. Soon we will be moving on to an Earth Science unit. In Math, we are beginning a unit on advanced addition and subtraction. We will continue to practice rounding, borrowing and carrying, and other strategies that can be used to solve addition and subtraction problems. I posted a few Fall Photos. Feel free to check them out! Have a wonderful week! As the marking period draws to an end, we are finishing up a variety of activities. Students will complete a few small math assessments so I can check their progress with the skills listed on the first marking period report card. They will be finishing their descriptive writing and drawing projects of monsters that I described last week. They will also be sharing their Native American legends. In reading, we will read different articles and distinguish facts from opinions. In October 13th's post, I included some information about the Halloween party. Feel free to email me if you have any questions, and remember that all volunteers need a completed background check for this school year. Have a wonderful week! We will have a Math test this Friday, so you will see a study guide coming home on Monday. As students solve multiplication and division problems, there are many strategies that can be used including skip counting, loops and groups, drawing an array, using the hundreds chart as a number line, and using other facts. These are all acceptable strategies at this point in the year as students build an understanding of multiplication and division. I am also sending home a hundreds chart for students to use at home. Please keep it in a safe place so it will be an option for your child as he/she solves multiplication and division problems. In Writing, students will create a drawing of a monster, using very specific details in their drawing - all the bumps, scales, and fur that they can imagine! They will then describe the monster in writing, using descriptive details. Our goal is to be more proficient at using adjectives and descriptions in our writing. In Social Studies, we will discuss what the tribes left us, which includes names, foods, games, and storytelling. We will read a few different Native American Legends, such as "How the Turtle Got its Shell." We will explore the key elements of a legend - it explains how something came to be, contains 2-3 characters that are usually animals, takes place in nature, and contains something that is fantasy. Students will eventually write their own and they will be graded on how well they meet the criteria of a legend. In Reading, students will read a variety of stories and learn to differentiate between fantasy and reality. Have a great week! Roosevelt's Halloween Parade will be held on Thursday, October 30th, beginning at 10:30 a.m. Please send your child's costume to school in a plastic bag, and students will be given time to change before the parade. Remember that per building policy, costumes should not be overly violent or gory. You are welcome to view the parade from the gymnasium. Please remember that only adults who have previously signed up to help at the classroom party will be allowed to participate. All adults helping out need to have a completed background check on file for this school year. Please let me know if you need one. 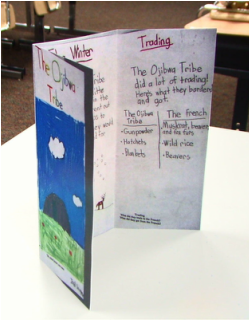 In Social Studies, students will be creating a brochure to show what they have learned about the Ojibwa Tribe. The brochure will contain information about the summer, the winter, trading, jobs of the men and women, and from where the tribe originally came. In Math, we will continue to study multiplication and division concepts. Have a great week! Last week, I sent home information about the Book-It program through Pizza Hut, in which students can earn a personal pan pizza each month for meeting reading goals. The goal is written at the bottom of the calendar - 20 minutes on 20 different evenings. The program is optional for students, but it is a great opportunity to encourage reading! Also, you will see a note coming home about Reading Eggs, a web-based reading practice program, that contains login information for your child. Feel free to have your child use this program at home! We will begin Social Studies by studying the Ojibwa tribe in Michigan. Other names for the same tribe include Chippewa and Anishinabek. We will read about the trading and bartering that occurred between the Ojibwa and the French Explorers, who traded for furs. Another big idea is that the tribe needed to adapt to the environment in order to survive. It lived near Lake Michigan in the summer to grow crops and fish. It split up into smaller groups and left the village in the winter to hunt. Our class will have its own Bartering Day this Thursday the 9th - please look for a note to come home with more information! In Math, we will continue to study multiplication using a variety of visual aids. In one activity, we will view arrays that are made up of real-life objects (like window panes), but some of the windows will be covered up by a tree. Students will need to use math reasoning and multiplication equations to predict how many total windows there are. We will also list all of the multiples of different numbers such as 2, 4, and 8, and then determine what they have in common. Our Reading skill this week is problem and solution. Students will read three stories about pets, all from different genres, and then compare and contrast the stories. I hope you had a great weekend! It was fun to see many of you at the Fall Family Festival. There is a Science Test this Thursday. I am sending home a study guide today, and it is due Wednesday, the day before the test. There is no textbook in our science program - we learn mostly through experiments and class discussions. Students should have the background necessary to complete the study guide, but feel free to let me know if there are any questions. We will also go over the guide together in class on Wednesday to make sure everyone has a good understanding of the expectations. In Reading, students will read a story called Penguin Chick and answer questions using complete sentences. They will also complete two short comprehension assessments with multiple choice questions. We have been learning so much in third grade! In Math, we will continue to explore double digit addition and subtraction. We will also practice writing equations and writing variables in the place of the unknown number. For example, Jen made $25 mowing lawns on Saturday. She mowed lawns on Sunday too, and at the end of the weekend, she had $60. How much money did she make on Sunday? There will be a Math test this Friday, and I will send home a study guide on Monday so that students have plenty of time to study. The study guide will be due on Thursday, the day before the test. If you notice that your child is struggling with a certain type of problem, feel free to create a few problems like the one on the study guide for extra practice. In Writing Workshop, students will write another personal narrative. In mini-lessons, we will discuss using exciting verbs, creating strong leads, and creating strong endings. In Reading, students will find main ideas and supporting details. Have a great week! In Math, students will continue to solve story problems and practice two digit addition and subtraction. You will see a short, four point assessment coming home (four addition and subtraction story problems) that I used to track progress. Although there are many strategies that can be used to solve these problems, a number of students need more practice with the traditional vertical methods. In Science, we will begin the week doing investigations about motion by making plastic frogs jump and by moving cotton balls by blowing through a straw. One key concept is that force is a push or a pull, and a force is needed to start an object in motion. We will also investigate what makes motion stop, and why a rolling ball comes to a rest. Students will discover that friction can change the way that an object moves. In Writing, students already wrote a short personal narrative (a small story about a memory in their lives), and they will continue to write narratives for a large part of this marking period. In our mini-lessons, we will discuss using descriptive details to describe the setting and using strong verbs to improve the writing. In Reading, students will read a fable called The Two Weavers. They will brainstorm character traits about the main character and study prefixes to better understand words in the story like incapable, nonsense, and disbelief. On Wednesday, we will check out books from the library for the first time, and students will take the NWEA Math Assessment in the computer lab this Thursday. Have a great week! Our year is off to a great start! What a nice group of students! In Language Arts, we spent time learning the keys to successful silent reading (Read to Self) which include choosing a just-right book, choosing a just-right spot, reading the whole time, self-monitoring comprehension, and building stamina. In the next couple of weeks, I will be administering individual reading assessments to determine reading levels and learn more about each student as a reader. We have also been reading stories together and studying the story elements (character, setting, and plot). the movement of an object can be described using a motion word, a direction word, and a speed word - for example, The basketball rolls forward quickly. There is a Spelling Test next Friday. I sent home the words on Friday the 5th on a yellow sheet of paper. That paper does not need to be returned to school. The spelling lists are less advanced near the beginning of the year, but they become more challenging as the year progresses. Over time, it can become evident that modifications or alternative lists are necessary for a few students, and that is something that we can address. Right now, I am still enjoying the opportunity to get to know students better as learners and as children. I'm looking forward to seeing you at Back to School Night. Have a wonderful weekend!